Within industries such as construction and landscaping, a lot of waste can be produced. All waste can be placed in a mixed building waste bin, but options are available to separate certain types of waste for recycling. One option is to separate dirt and clay. Dirt and clay is screened and reused where possible to go back into the construction, landscaping and other ground-working industries, reducing landfill. If you need to load other waste into the bin, you will require a mixed building waste bin. At Matt’s Skip Bins, we’re dedicated to being environmentally friendly. We ensure that all your waste is properly recycled, so that it doesn’t end up in landfill. For more information on our recycling services, call our friendly team today on (02) 4708 2927. Every council across Sydney has varying regulations that surround skip bin hire. Depending on your council, you may need to apply for a permit if you require the bin to be placed on council land. At Matt’s Skip Bins, we have skip bin sizes to suit everyone’s needs. From our compact 2 cubic metre bin to our heavy-duty 9 cubic metre bin, we can accommodate all of your dirt and clay disposal requirements. Whether you’re a builder, concreter, landscaper or plumber, all tradespeople can benefit from a skip bin. With bins as big as ours, you’ll be amazed at the amount of waste that you can get rid of. 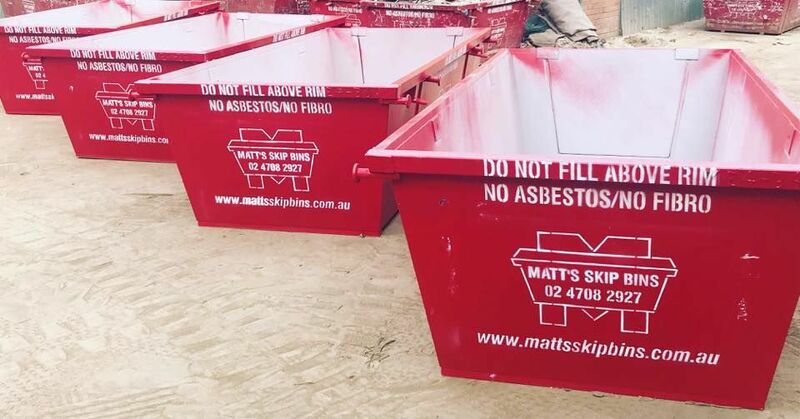 If you’d like to know more, or if you’d like to place an order, you can book online or call Matt’s Skip Bins today on (02) 4708 2927.